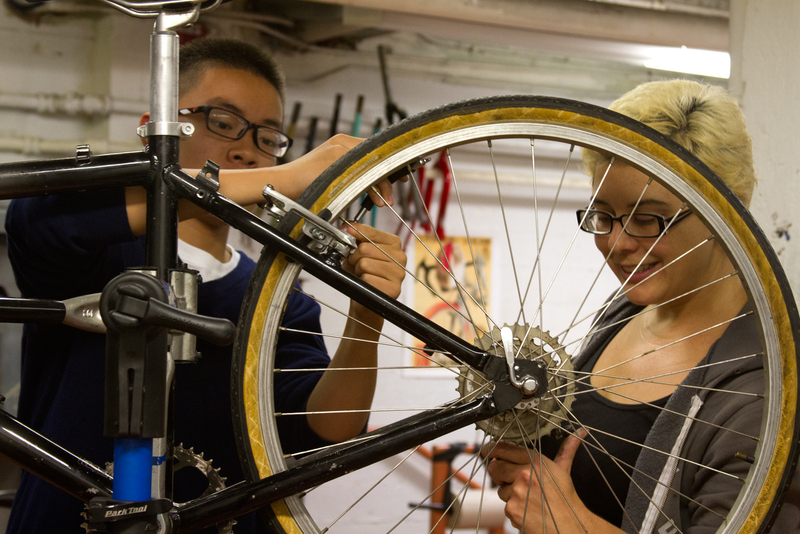 Bike mechanic Esther Cervantes helps Mission High student Yuxin Mao repair a bike. Photo by Courtney Quirin. The bell has already rung and Esther is nowhere to be found. Patrick Tam shifts his weight from foot to foot, standing on the edge of a workshop table. Next to an aged silver Sony boombox and a large contraption called a truing wheel stand, Patrick turns and scribbles down his name on a purple sign-in sheet, and continues to wait. “I wanted to tell Esther about career day,” he says to fill the time. While Patrick is a student at Mission High School, his friend Esther Cervantes is not. And she’s not a school counselor or a high school teacher either. Rather, Esther, as students call her, is a 35-year old, bleach blonde, pixie-cut bike mechanic, who spends every Tuesday and Thursday toiling away in the basement of Mission High where she teaches students the ins and outs of bike mechanics — covering everything from changing a flat to building a bike from scratch. But looming underneath the classic rock blasting from the boom box, and hidden between the sound of wrenches yanking off pedals and adjusting gears and spokes, quiet conversations reveal that the bike club is about much more than mechanics. While different waves of students have flowed through the after-school program since it was conceived a year and a half ago, one thing has stayed consistent: an overwhelming majority of the students are new to America, mostly within the past two years, and for many their grasp of English is far from strong. “Sometimes we have periods of months where barely any English is spoken,” says Esther of the eight regular students who comprise the club. Crouched down, eye-level with the workbench, Munkhbat Chinbataar spins a wheel that is mounted on the truing contraption and squints with pointed concentration as he tries to identify the imperfections in the wheel’s shape and rotation. When asked what he is doing, he struggles to articulate it in words, but it’s clear from his deliberate actions that he knows exactly what he is doing. Now in 11th grade, Munkhbat moved to San Francisco from Mongolia last year, and joined the bike club immediately. He’s been a regular ever since and has grown to be one of the in-house pros. He’s already built up several bikes from scratch and has been to “too many” workshops to count. Stripping a bike of its parts a few strides away is 10th grader Yuxin Mao, another in-house pro, though he often can’t remember the words for many of the bike parts and tools that he uses flawlessly. Moving to San Francisco from China just three months ago, Yuxin still struggles with English, and he has already learned how to build a bike from scratch and is now onto his second one. Nationwide, students like Yuxin and Munkhbat face language and cultural barriers that compromise their ability to thrive in high school; feelings of isolation paired with the difficulties of navigating a new school system and language often result in low scores on standardized tests and high drop-out rates, like the 52% of foreign-born Latino drop-outs identified in a 2010 Pew Hispanic Center report. But Mission High School is trying to reshape this bleak outcome. With 40 percent of its student body comprised of second-language learners, 80 percent of whom have been in the United States for three years or less, after-school programs like the bike club are critical to the school’s work. When asked if it was hard to make new friends when first arriving at Mission High three months ago, Yuxin nods, struggling to make eye contact. “Both the language and school are different systems,” he adds. “We’ve had a lot of students whose English is not great. It’s appealing to do something useful, and physical, and not have to describe it in words,” says Esther of the draw of the bike club to second-language learners like Yuxin. And while the initial allure may be an escape from the weight of conversing in English, bikes eventually draw newcomers out of their shell, enticing them through different ways of learning that improve more than just their English. In fact, if you were to close your eyes and listen closely to the conversations fluttering around the workshop, you’d soon believe that you were in math or physics class, not a bike shop. “Who’s had geometry here?” Esther asks three teenage girls huddled around her. Bike wheel in one hand and thin metal wires in the other, Esther continues: “We call this tangentially laced,” as she weaves in a new spoke beginning perpendicular to the rim of the wheel. Conversations like these serve as a gateway, says Hoss Koch, a Mission High math teacher who founded the bike club a year and a half ago. But even more critical, the bike club helps build confidence, Koch says, which ultimately empowers students and gives them the tools to evolve into leaders. Hovering over an inoperable bike mounted on a stand, Yuxin quietly shows 12th grader Ruth Beyene how to fix her brakes. While Ruth is from San Francisco and a tenured student at Mission High, she’s new to the bike club and is in the midst of building her first bike from scratch. “Wow! You’ve only been here three months!” says Ruth amazed at Yuxin’s mechanical skills. Explosive conversation unfolds, pulling Yuxin out of his otherwise very shy shell.